If actions speak louder than words, on June 23rd citizens from every corner of the United States came together and sent an unequivocal message that must have shook the halls of power. 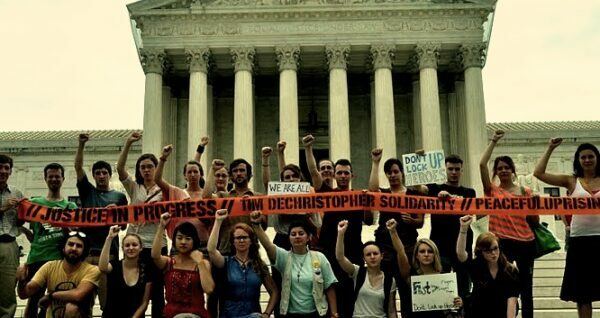 Solidarity at Federal Courthouses across the country. "Justice Restoration in Progress"
Just days before he was scheduled to hand down a sentence to Tim DeChristopher for interrupting an illegal BLM oil and gas lease auction of public lands, Federal Judge Dee Benson changed the sentencing hearing from June 23rd to July 26. National protests had been organized, and guests were already on their way to Salt Lake City to demonstrate. This was the 10th time Benson had delayed proceedings under similar circumstances over the course of two years. If it was another attempt to deflect citizen outrage and attention over the unjust trial and subsequent conviction of one of their own, it failed. In Salt Lake City, we focused on workshops and trainings within our community, and then took on the task of rebuilding by volunteering some of our time to help build a garden for what will become Utah’s first net-zero school. 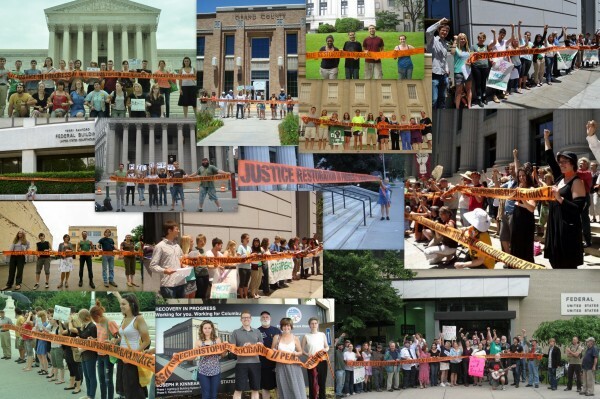 Nationwide, we sent a clear message that Climate Justice will not be delayed, by inspiring solidarity events in all federal district circuit courts – many of which were organized within a week! On top of that (orange streamer) I had a large white sign printed with ‘So, here we are, going about daily life. MEANWHILE…,’ and one one side I had a long list of current climate catastrophes, internationally, nationally and locally, and on the other side I had about 25 things people can do to amend climate change, from ride a bike, to lobby your gov/work, oppose free trade, eat less meat, go on a peace walk… and then on top of the I had a painting of planet earth. I almost got arrested by a Homeland Security officer, but he agreed on his 2nd trip to visit me that if I dismantled my ten foot totem and laid it down on the side walk in parts he wouldn’t take me to Macon. 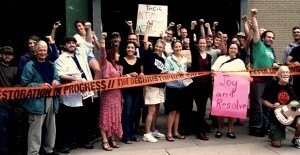 The action in Brattleboro felt strong; we showed up, waded into the mix and did it. And also it was a small gathering, only 5 folks, so also it felt small and frail. 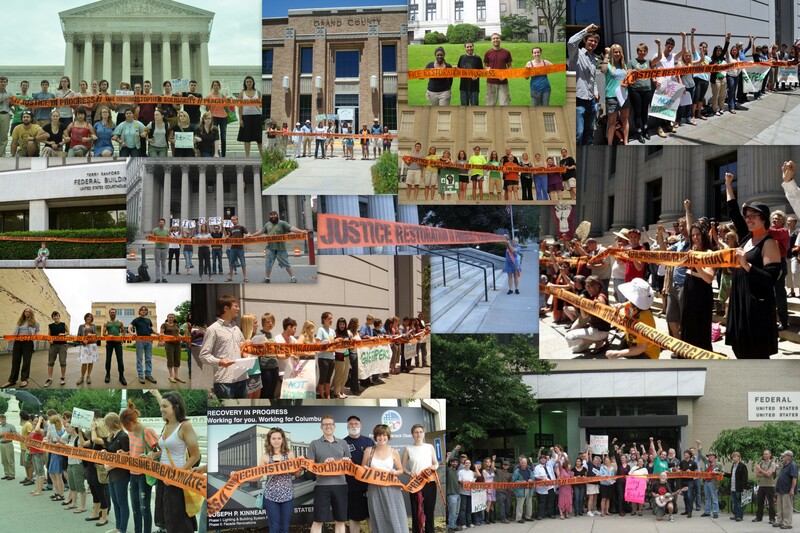 But when I saw our picture amongst the photos from around the country, it felt powerful, like being part of a movement that’s bigger than it knows; that there are lots of us that want climate justice and the doable future. Give him his day in court or is the judge afraid of the truth!